The 4th of July is a time of celebration. A time to celebrate our nations independence, it’s “birth”. 238 years ago, our fore fathers signed the Deceleration of Independence, handing to the men and women of our country, freedom. Fireworks have always been a part of the celebration. I find it interesting that when the first ones were lit back in 1776, they were actually used mockingly, because fireworks were generally only used in celebration of the royal birthdays. Our forefathers instead used them to show the separation of the colonies from England’s hand. Why the history lesson? Well, because I am not a fan of fireworks, in fact I really don’t care for them at all. To me they are loud and a waste of money. When my children were small and wanted me to buy them fireworks, I refused. I would tell them that we could just light a $20 if they wanted to, because we would be just blowing up money. Please remember I was/am a single mom and I raised my children alone from the time the oldest three were 3 ½, 2 ½ and 6 months old. I sometimes didn’t have enough money to pay the bills or buy groceries. Why on earth would I spend money to just waste in such a matter? Don’t get me wrong, I love the 4th of July, the significance of the Deceleration, the sacrifice of so many men and women in the past, those who continue to serve that we might maintain the freedom we were given nearly a quarter of a century ago. I just don’t care for the noise and extra hoopla. I have always tried to attend fireworks displays in the communities that we have lived in and have usually found them enjoyable. We have generally always had someone around who doesn’t mind blowing up their money, who have shared the “fun” of setting off your own fireworks with my children. I feel like I might be rambling, but it’s been a weird couple of weeks, after participating in our church’s VBS the third week in June my now youngest headed off with family friends to camp for the week. With her gone and my latest HS graduate busy with work and spending time with friends before she is off to college, I found my house very quiet, a real empty nest. That much quiet and alone time makes a person’s mind go to a lot of places, pondering over the future as well into the past. My mind did some wandering down memory lane, and reminded me of something more significant as to why I certainly have such an aversion for the 4th of July. My son came home this summer from his first year in college with a new major and a heart on fire to take action towards his new path. This young man who helped with our church’s Awana program all 4 years in high school as well as helped with VBS for more than that has a noted calling to be a positive presence in young children’s lives. Literally every Wednesday evening at the beginning of the evening and again at the close, he would have children surrounding him, climbing on him; laughing and having fun. I gave him the nickname of “the walking jungle gym” because that is just what he did. He would continue walking around with 3-4 of the kids actually hanging from him in some shape or form. So after being Undecided a good portion of his freshman year in college, he chose to take a very different route than initially intended. It was actually at his birthday lunch at the end of April he shared with me his new path (Family Services, so he can work with children) and it was nice to note the excitement in his voice. He was home less than a month later and had inquired to me if the local day care might have any openings. I said I didn’t know but that our church bulletin had a note that the local church camp still needed college aged counselors for the summer. Within a few days of being home, he would complete their online application and shortly after got a phone call and was soon at the camp in person for an interview. He would be offered the job and spent the week of Memorial Day at the camp in preparation for 8 weeks of a life changing experience. He had told them in the interview process that he would need to have one week off, to come home and assist with VBS as he has done for a few years now. They told him that would be OK; however my son came home from his training and explained to me that he really thought he was supposed to be there the entire time. That he believed he was really supposed to be there that week in particular. I reminded him that if he felt that strongly, that was God speaking to him and he should listen. He spoke with our VBS director and for the first time in 4 years would not be a part of VBS. This weekend my son is home for only the second time in 5 weeks. He came home with friends last weekend and it was so fun to see him laughing an interacting with these young men. He had always been a quiet kid with just a couple of friends and never really did a whole lot outside of the house besides band. So to have him growing in this matter warmed this mother’s heart. Because of the 4th falling on Friday, the camp week was shortened by a day, meaning he got to come home sooner and spend some time with family. He arrived home Thursday evening and we just set on the couch and visited about what God is doing in his life. He shared with me about bible studies and the things in the Word that were really exciting to him. He spoke to me about sharing his testimony, and when I reminded him of something I remember about his spiritual journey, he thanked me. Stating, “That will be good to add, because I couldn’t remember it all”. It was during this time he also shared with me that the week of VBS was their biggest camp week and that he had two really great kids that week… Certainly God-directed and the benefits were clearly seen in the happiness on his face. Through the last 24 hours with him we have also watched a couple shows, both which have had a young man in them (close to his age), struggling to find his way, to be a man on his own, separate from his father. This is just what my son is doing, becoming a man of his own making. And like the second young man in one of the programs we watched, he is doing so without influence from his father. This makes my heart sad, but I am so happy that my son has finally allowed God to be his Father, to be guided and taught by Him. When my kids were small, before their youngest sister came along there would be the occasional question about their dad, and because he has always been completely out of the picture I would do my best to console them. I would remind them that God was their Daddy. My son looked me square in the face one time and said “I know Mom, but if we had a real daddy, God wouldn’t have to”. That about broke my heart, and his words are still clear in my mind. In that moment, I didn’t know how to respond. Today I would merely remind him that God wants to be his “daddy”, what a blessing to see he is finally embracing that fact and allowing God to be his loving Father. Which brings me to last night’s fireworks display which I attended with all my children as well as my oldest in-laws. As I set a bit off to myself I was filled with sadness, and as I thought about it, I recalled another reason I don’t really like the hoopla of fireworks any longer, I say any longer because I realized that there was a time when I did enjoy them; when we enjoyed them. When my oldest two were quite small and I was still with their father, we lived in Jackson Hole WY, and let me tell you, they know how to put on a show! 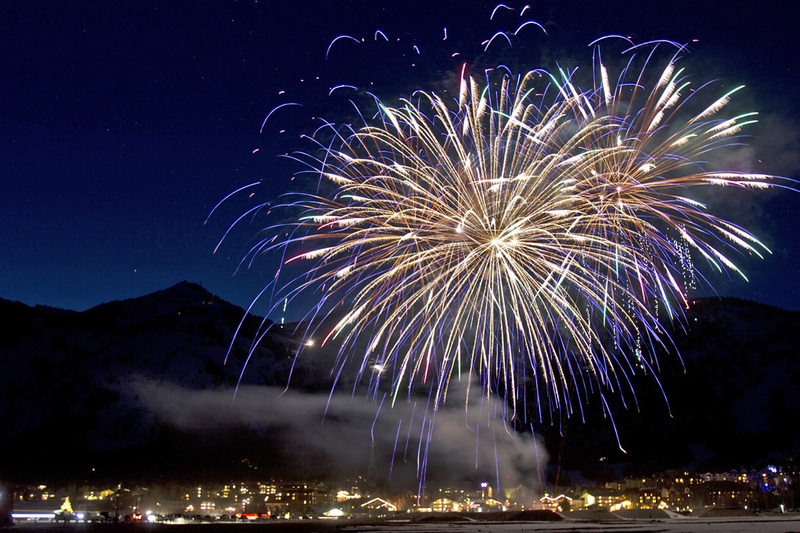 It’s called “Fire in the Hole” and when you see and hear a fireworks display while sitting at the base of the Teton Mountains, well… it is truly spectacular. For us and our little family it was one of the highlights of our summer and when everything fell apart and got so bad, those warm and happy memories got lost in the mud and the muck created by the ugly ones. Because the broken and ugly that my life had become was too overwhelming, my mind and heart were merely just trying to protect me, by eliminating them from my thoughts. God was pretty awesome when He designed us that way. A built in protection process that comes into play when we need to heal. So mystery solved, obviously the 4th of July will always be a bittersweet moment for me. But I am hoping that after being able to recall and process this moment from my past, I can enjoy the celebration of our nation’s independence just a little bit more. Am I going to run out next year and buy my own fireworks? NO! I still think it is a huge waste of money, but perhaps next year when the colorful lights are filling up the Nebraska sky, I will smile a bit more, and even oooh and aaaah with the rest of the crowd. However, I will say I most certainly agree with my son who shared with me in our conversation the night before last; that his favorite thing that God created is the stars. I think so too, and to be able to sit out on a clear evening and marvel at all they are is even more awe inspiring to me.